Check our handy withdrawal guide to ensure the animal is not on/has not recently been on any medications which could interfere with the test results. Test when the animal is symptomatic, as many allergens are seasonal and the IgE response is relatively short-lived. When testing for food allergy make sure the animal has not been on a restricted or hypoallergenic diet for at least the last two months. Remember we can store blood, here at the lab, free of charge for 3 months. This enables you to send a sample when you first suspect allergy. You can then do the full work-up and obtain test results safe in the knowledge no drugs/diets/other treatments may have influenced the results. 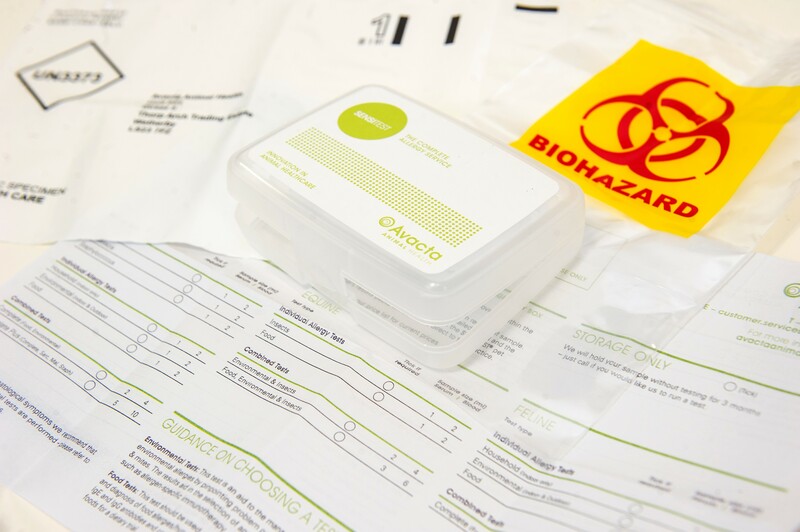 To submit a sample we provide a submission box containing a submission form, a biohazard bag and a reply paid envelope. To request a test submission box please call Customer Services on 0800 3 047 047 or complete our Request Form (UK only). Choose a test type or indicate if the sample is for storage. If you select storage only, please do not tick a test type. Take the required sample as detailed on the submission form. Use a plain or serum gel tube take a sufficient blood sample and centrifuge to extract the serum. For information on other sampling techniques click here. Please label the samples with the pet’s name, owner’s name and date and then complete the details on the submission form. Place samples in a SENSITEST® submission box or other protective packaging. Please ensure the samples are packaged with absorbent and padded materials. UK ONLY – Send by post using the freepost envelope provided within the submission box. NON UK VETS – Please send via 1st Class Post or Courier.